Dry eye syndrome, or dry eye, is an issue where the lubricant and moisture on the surface of the eye is insufficient. 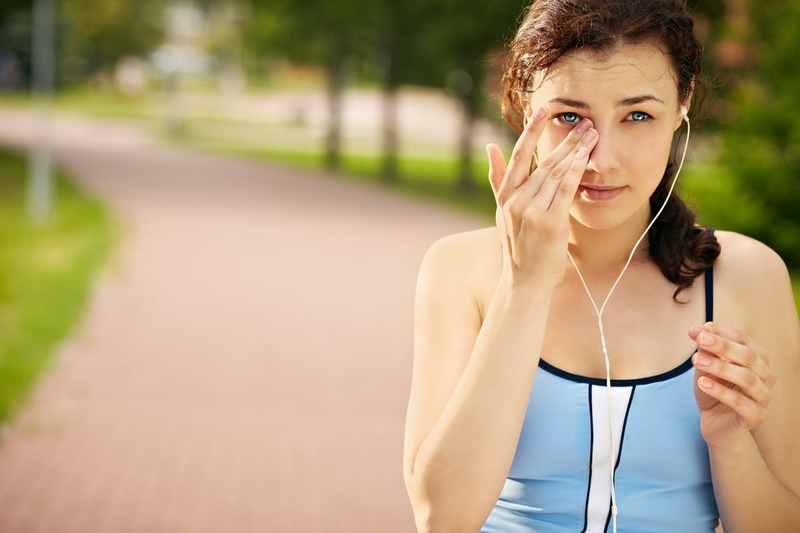 With allergy season upon us and dwelling in the desert, suffering from dry eye can be more than inconvenient and uncomfortable. Over time, chronic dry eye can cause inflammation and even scarring of the surface of the eye, which can affect the outcome of LASIK or cataract eye surgeries. Addressing any lifestyle factors that contribute to dry eye and seeing an eye doctor for an eye exam are the first steps toward addressing the condition. Dysfunctional tear syndrome; an inadequate quality of tears can be just as detrimental as inadequate quantity. Keratitis sicca; dryness and inflammation of the cornea. Keratoconjunctivitis sicca; affects both the cornea and the conjunctiva. While the symptoms can vary from person to person, most experience minor irritation, have an inability to wear contact lenses and may have an elevated risk of corneal inflammation and the development of eye infections. Patients will require an eye exam by an ophthalmologist or optometrist in order to be correctly diagnosed with chronic dry eye or DES. What Causes Dry Eye & What Treatments Are There? There are quite a few dry eye causes, with the most common cause of DES being the natural aging process. Another quite common stimulant of DES comes along as a side effect of many medications, as well as computer use, indoor and outdoor environments and frequent flying. Patients who live in dry, dusty climates, such as here in Arizona, or windy climates with low humidity may also have an increased chance of developing dry eye. After completing an eye exam and diagnosis, a patient’s eye doctor may recommend artificial tears, which are moisturizing eye drops that decrease the dry, scratchy feeling and itch associated with dry eye. Prescription eye drops for DES go one step further, they work to increase your tear production by decreasing inflammation. In some cases, patients may be prescribed a steroid for immediate short-term relief. Another option for dry eye treatment involves a tiny insert filled with a lubricating ingredient. These inserts work like artificial tears, continuously releasing lubrication throughout the day. For patients that suffer from extreme dry eye, autologous serum eye drops may be the answer. These drops are made from the patient’s own blood cells that contain naturally occurring ingredients that are known to speed up healing and increase lubrication of the eye surface. For severe cases of dry eye, an eye doctor may recommend a procedure to help alleviate the effects of DES. Punctal plugs have been found to be a successful dry eye treatment. These tiny devices are inserted into the ducts in a patient’s eyelids to block drainage, increasing the eye’s tear film and surface moisture. Meibomian glands, tiny glands in the eye that secrete oils, can sometimes become blocked. If a patient suffers from Meibomian gland dysfunction, their eye doctor may decide to probe and dilate these glands, or recommend a Lipiflow treatment to open the glands to increase oil secretion. Intense pulsed light (IPL) treatment has also been found to produce results in some patients who suffer from dry eye. Eye doctors will explain to patients that the IPL is absorbed by dilated blood vessels, therefore helping to reduce inflammation. It is important to remember that dry eye causes will help direct the treatment plan that’s right for you. Please contact us to get on the road to recovery from dry eye.